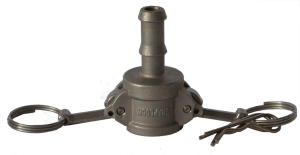 Camlock connectors are used to create watertight quick connections between brew pots pumps and flow systems. Homebrewers love the Type C Coupler! Type C Couplers are typically used with Type E Adapters but can also be used with Type A and F Adapters and DP (Dust Plug) of the same size.